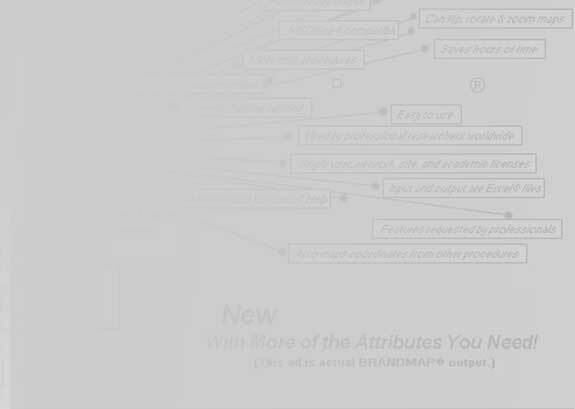 Welcome to a quick tour of BrandMap® 8.0! This short tour emphasizes the ease of use of the BrandMap, and cannot display all the features and options of either the statistical or presentation aspects of the product. Please see the BrandMap feature sheet and/or call if there is any aspect of the product you would like to discuss! In Excel 2007 or 2010 you will find a BrandMap tab in the ribbon interface. 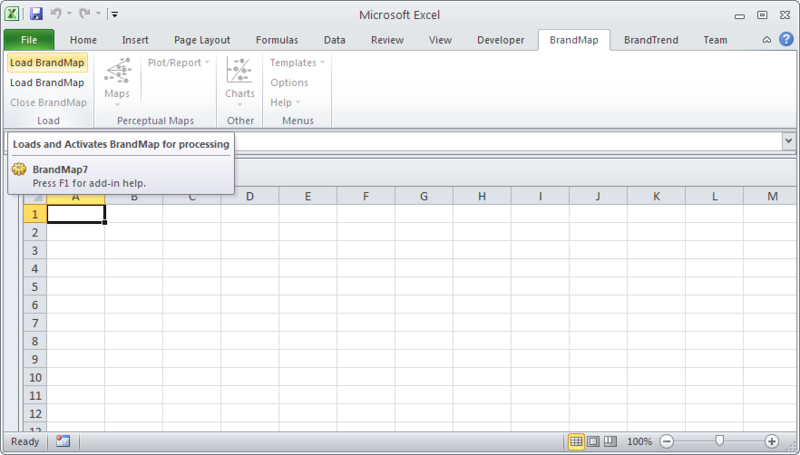 (In Excel 2003 you will find an Excel toolbar which you can use to load the "Maps" menu.) To start BrandMap, select the "Load BrandMap" button. After choosing biplot, the following biplot options dialog appears. We select the default options, and click on OK..
Because the BrandMap statistical routines run in compiled code, we very rapidly get a complete set of statistics for our analysis, including coordinates, correlations, and variance, nicely presented in an Excel spreadsheet. and the map can be printed to any Windows printer, or easily pasted into other packages, such as PowerPoint. The image above also shows the mouse "pop-up" menu which can be selected with a left mouse button click while holding down the left shift key. At this point in our analysis, we may want to know what combination of image scores we would need to have to move a brand to some particular point on the map, say closer to the market leader. To do this, we simply drag the Brand Projector™ object (purple star below) to the desired spot and double click on it..
After selecting the brand we wish to 'Project', we get a chart indicating the changes necessary to move to that point. As you can see, BrandMap is an ideal program for rapid (presentation ready) production and analysis of perceptual maps. Correspondence, multiple correspondence, and mdpref maps are generated in the same manner, and have all of the same capabilities, and their own appropriate statistical options. BrandMap additionally allows for the direct mapping of coordinates you may have from other procedures, and provides a facility for automatic labeling and production of quadrant charts (scatterplots).